The elections in Punjab have unseated the Congress and ushered in the Akali-BJP. But will this change the fortunes of hundreds of cancer-impacted families in the Malwa region? Village after village is plagued by pesticide-linked cancer and rising debt. Umendra Dutt writes about Jajjal, one of them. Manish would be the future of his poor parents, but at the age of two he cannot move, not even toddle. Manish suffers from cancer since his birth. He has an abnormally enlarged head, indicating that he has other serious ailments as well. His father Tarsem and his mother are both daily wagers, working as labourers in the nearby town of Rama Mandi. Tarsem has taken a loan of Rs.25,000 for Manish's treatment. This dalit couple knows that their child will not live long, but they want to give him better treatment. However, they have no means to afford it. They are a landless family, and no one would give them loan beyond a limit. Jajjal, the village they live in, appears to be cursed. Kartar Kaur, 90, who lost her three sons to cancer. Pic: Sarvottam Sharma. Jajjal is a small village with 500-odd households and a population of about 3500. It is about 30 kms from district headquarters Bathinda, near the historical Sikh shrine Damdama Sahib in the Talwandi Sabo block. This is Punjab's south-western region, called Malwa, a predominantly cotton growing area. There are many more Tarsems and Manishs in Malwa. Cancer is a frightening condition, especially if you are born a poor farmer or labourer in a village. 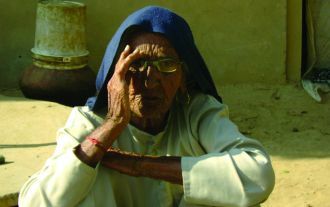 Kartar Kaur of Jajjal is a 90-year-old mother, who has seen all the changes in their land in the last century. Today, she lives with little hope. She has lost her three sons, one by one to cancer. Choota Singh was only 45 years when he died in 2002. Then Balbir Singh died in 2003 at the age of 60. Jalore Singh died in 2005 at the age of 45. The family had a debt of Rs.nine lakhs, borrowed for treatment, and after losing the sons, the family still has Rs.six lakhs to pay off. The family has had to sell all their moveable things and even their tractor. Even in the face of this disaster, they have got no aid or relief from the government. Cases as Kartar Kaur's are not uncommon in agrarian Punjab. In 2002, Jajjal village made headlines and posed a burning question to the state administration. The media brought out the story of a retired government teacher, Jarnail Singh whose study revealed the abnormally high incidences of cancer deaths in Jajjal and adjoining villages. The village had witnessed about 20 cancer deaths and several new cancer cases were being reported. Following this expose, several experts and study teams from across the country have visited the village in the last five years. But the suffering villagers got nothing. "We got nothing, except visiting cards of media persons, government officials and doctors! We have become infamous for cancer, it is becoming almost a stigma for most of us," says a villager Jaswinder Singh, a farmer. The cancers in the Malwa region have been a raging story for a few years now. The rise in cancers have been linked to environmental and in particular, drinking-water contamination, due to farmers' excessive use of pesticides in agriculture. Pesticide sale and use has been growing in this region. Studies from the Centre for Science and Environment (CSE) and Greenpeace had shown earlier that environmental loads of pesticides were the highest in this village. In June 2005, CSE released a report showing presence of pesticides in blood samples collected from villagers. The report noted the presence of cocktail of six to 13 pesticides in the blood samples. CSE also found organochlorines and residues of the newer and so-called 'non-persistent' pesticides  organophosphates in blood. Organophosphates are far more toxic than the older organochlorines.  The higher pesticide consuming block of Talwandi Sabo had a far higher rate of cancer prevalence then the lower pesticide consuming block of Chamkaur Sahib.  The levels of heavy metals such as As, Cd, Cr, Se, Hg in drinking water were generally higher and pesticides such as heptachlor, ethion and chloropyrifos were also higher in samples of drinking water, vegetables and blood samples in Talwandi Sabo block as compared to Chamkaur Sahib.  Talwandi Sabo has significantly higher number of cancer cases and deaths as well.  A comprehensive study of status of environmental health in other cotton growing areas of Punjab be conducted.  Setting up of a cancer registry in the state.  The Public health department should monitor the level of pesticides and heavy metals in drinking water periodically. None of the recommendations have been implemented. In February 2005, the Post Graduate Institute of Medical Research (PGIMER), Chandigarh, had submitted its own report. The Punjab government had initiated the study. The report also proved that pesticides are one of major source of environmental contamination (see box). The PGIMER report recommended that a comprehensive study of status of environmental health in other cotton growing areas of Punjab be conducted. It also recommended the setting up of a cancer registry in the state. Another major recommendation was that that the state's public health department monitor the level of pesticides and heavy metals in drinking water periodically. But none of the recommendations have been implemented. There has not even been an effort to start a simple early detection cancer camp in the region. Senior officials have not visited Jajjal. The Punjab Pollution Control Board, who according to then Member Secretary Malvinder Singh spent more than Rs.15 lakh on its study, seems to have buried its report and the health department seems to have totally forgotten to take any remedial measures. The Congress state government made several declarations about providing medical help for the cancer patients, but did practically very little. For Jajjal, many assurances were aired, but till date only three families in the village have got financial relief of Rs.22,500 each. This is when the village has at least 55 cancer deaths on record. A rapid door-to-door survey done for during December-January by a team from the environmental NGO Kheti Virasat Mission (for internal assessment) found that 48 cancer cases out of which 36 persons died and 10 others are currently battling for their life. Jajjal is still awaiting a full-fledged environmental epidemiological study and house-to-house surveillance, much necessary even to understand the depth of this crisis. It is as if, a dying village has been left to its fate. The just-concluded elections to the Punjab assembly have seen the Akali-BJP combine unseat the Congress government from power. Jajjal falls in the Talwandi Sabo constituency. Jeet Mohinder Sidhu (Congress-I) and Amarjit Singh Sidhu (Shiromani Akali Dal-B) contested from here. Both promised to establish government cancer hospitals, with free treatment. The Akali Dal had included the establishment of a cancer hospital in its election manifesto. But the elections have had an odd twist for Jajjal. Jeet Mohindra won the Talwandi Sabo seat, and his party is now in the opposition. Elections apart, most of the villagers in Jajjal do not want to talk about cancer. Even cancer patients keep a silence about their disease. The code word is 'Bikaner'. 'Going to Bikaner' means a visit to the cancer treatment facilities at Bikaner. But most people, who doubt they have cancer, fear to go for a medical check up  the huge costs being a deterrent. Even after treatment, the lives of many are in ruins. Seventy year-old Mukhtiyar Singh, who got his cancer affected kidney operated, was forced to sell his tractor and a piece of his land to meet the expenditure for the treatment. And he still owes a debt of Rs.two lakhs. Mukhtiyar Singh says, "We manage by curtailing our needs, we cook vegetable once a day and take the meals thrice a day with that." There's more. Cancer is only one aspect of Jajjal's trauma. Today villagers are also facing very severe reproductive health problems. Premature aging is very common. Pain in the joints and spinal problems are making the youth of the village older than their age. The preliminary findings of KVM's rapid survey are quite disturbing. Almost all the households have some health problem or other. According to responses received in the survey, cancer has become too common, but other diseases -- heart ailments, paralysis, skin problems, asthma and arthritis -- are causing suffering. These health problems, many related to environmental contamination, have become common enough that the villagers are accepting them as their fate. In sum, soaring debts, polluted waters, cancer, male and female reproductive problems, neurological ailments, etc. have shattered the families at Jajjal. Each family carries a debt of anything between one to three lakh rupees, according to KVM's study. For many families, the situation is worse. India's agrarian situation in general has already been worsening, with mounting farmer debts and suicides around the country. Jajjal witnessed about 20 farmer suicides in last ten years and there are several others who have sold their land and moved out of agriculture. Now they work as landless labourers. Jajjal is not a village that may collapse all of a sudden one day to a catastrophe, but it's a village whimpering itself to death. Amidst the governmental apathy and darkness, there are a few rays of hope. Jarnail Singh runs a Vatavaran Chetna Kendra (established by Kheti Virasat Mission) in the village. He has started this with the hope of making Jajjal pesticide-free. He successfully does pesticide-free natural farming and also motivates other farmers to join this community initiative. The farmers are aware of adverse impacts of pesticides and have reduced its use. Jajjal now needs a new lease of life. This village and hundreds of other villages in the districts of Bathinda, Mansa, Muktsar and Faridkot need to be nurtured back to health, life and sustainability. A strategy and action plan for sustainable agriculture, free of chemical inputs and ensuring better and safer production, are needed. Villages free of toxicity and cancer, debt and suicide must be the goal. Umendra Dutt is the Executive Director of Kheti Virasat Mission, an environmental NGO based in Jaitu, Faridkot district, Punjab. KVM is involved in advocacy and support for sustainable and pesticide-free agriculture.